The link between soda and poor health is the talk of the town as the research becomes ever clearer on the strong link between sugary beverages and risk for chronic disease. For good reasons, the public health community has heavily targeted those bubbly sugary drinks, but juice drinks (and even 100% fruit juice, if consumed in high quantities) are similarly harmful. In fact, many consumers are unaware of just how much sugar is in 100% fruit juice (and juice drinks are a whole other story). While 100% fruit juice contains vitamins and minerals, it also has a lot of sugar. Eating whole fruit and vegetables instead of drinking juice provides more nutrients like fiber, which helps us feel full longer. Below is a table outlining common fruit juice and fruit drink names and their accompanying percentages of real fruit juice. Many beverage companies put pictures of fruits and vegetables on their product packaging to suggest health. These packages can be deceptive. 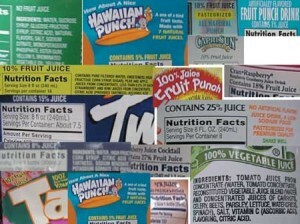 Reading the Nutrition Facts label is your best bet for knowing the actual fruit juice content of these kinds of drinks. Make sure to look for 100% juice. 6 to 12 months. If juice is given, limit it to 1/2 cup to 3/4 cup and serve it in a cup (not a bottle) to avoid tooth decay. 1 to 6 years. No more than 3/4 cup a day. Healthy & Active Before 5 has a Healthy Food & Beverage Policy (and so do many other Contra Costa organizations). Our policy holds us accountable by stating that we will not serve sugar sweetened beverages or 100% fruit juice to children or adults at any of our agency’s events, activities, or celebrations. Consider adopting a Healthy Beverage Policy at your organization. If you qualify, your organization could get a $500 mini-grant to support policy implementation. Need some ideas for alternatives to sugary drinks for your little ones? Check out our last blog post!